In 2004 Jeff Button, a 1981 Hayes graduate, was a sergeant with the heavy mortar platoon at Fort Irwin 50 miles west of the Mojave Desert in California. On July 24th, Jeff, his wife Rhonda, and sons Jeffery(10) and Morgan (4) were riding their family’s all-terrain vehicles in the Mojave Desert when they had to stop for a minor repair. This man lived only 12 miles from where Jeff grew up! Jeff contacted The Sunbury News and the Community Library. Polly Horn put him in touch with Maxine Longshore who wrote the Linnabary family history in 1975. 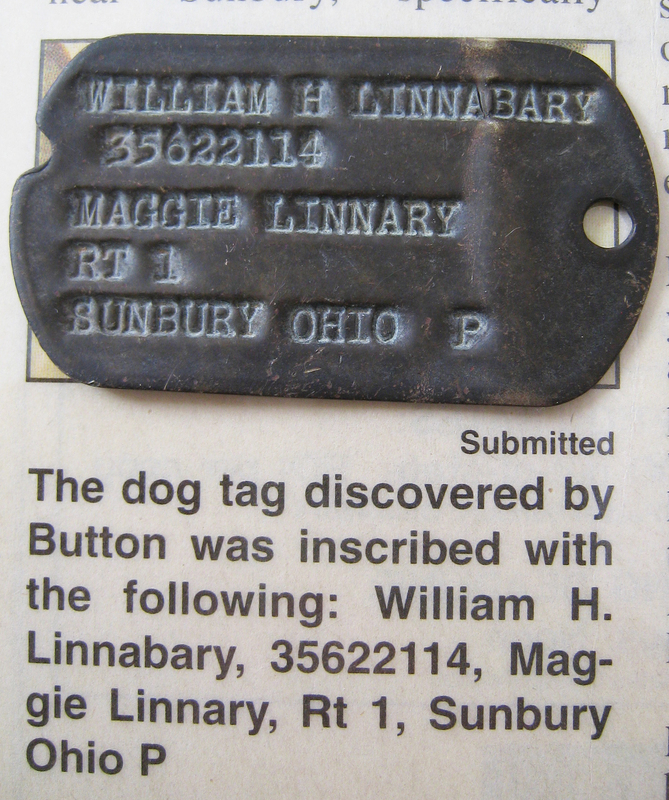 Maxine speculated the tag belonged to William Henry Linnabary, her father’s distant cousin. He lived from Nov 9, 1908 to Sept., 20, 1998. His parents were John and Maggie (Ginn) Linnabary. Clues from the tag told Buttton Maggie was his next of kin. Indeed it is his mother’s name on the tag and it was shortened because of the hole to hang the dogtag or perhaps it was just misspelled. In July 1943 they ceased putting next of kin on the tags so it was issued before that. Jeff discovered the serial number identified the soldier as a draftee called up by the Selective Training and Service Act of 1940 assigned to the Fifth Corps. The Fifth Corps consisted of men from Ohio West Virginia, Indiana and Kentucky headquartered at Fort Hayes in Columbus. Rt 1 was the postal area south east of Sunbury where the John Linnabary family lived. Within a 15' perimeter of the dog tag, Button found a brass button, a single edged razor with "Star Super Edge" imprinted on it and a 7.62 shell casing dated 1942. The casing looks as though it was exploded rather than discharged. These items and other he found in the desert are in the display. Marian Whitney’s WWII Scrapbook told a little more about this soldier. William Linnabary was home on leave early in July 1943. He stopped in the News to chat with Editor Bill Whitney and said he had been stationed at Camp Haan located in Riverside County, in California. This is very near the Mojave Desert so it is easy to imagine he did maneuvers there. While on maneuvers Linnabary said he had to carry a 200 pound man on his back while running 75 yards and jumping hurdles. Each soldier was given a quart of water per day which had to take care of washing, shaving and drinking. They were requested to shave each day. Linnabary went on to say when he returned to camp, he would be in charge of the ammunition supplies for the entire outfit. Whitney noticed the Sharpshooter’s medal Longshore was wearing. He explained he had a marksmanship record for hitting 194 out of a possible 200. For 19 months Linnabary was part of the Black Panther Division in Europe. 36 days after leaving there he was discharged out of Fort Indiantown Gap in Lebonan County Pennsylvania on November 1945. There is a William is buried in Kingwood Memorial Park, Lewis Center, Delaware County, Ohio. Death date is September 20, 1998. There are no other Linnabarys buried with him. ANyone knowing more about William is ask to share the information. The items from Button are on display in the Myers Inn Museum, 45 S. Columbus Street in Sunbury.